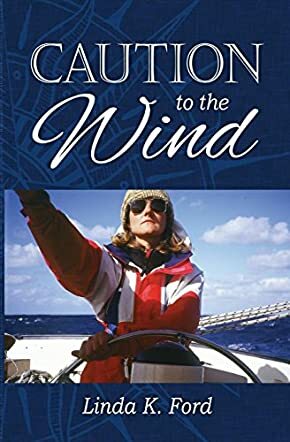 Caution to the Wind by Linda K Ford is a powerful memoir that had me spellbound — at first I thought it was fiction — a breathtaking adventure across the seas and a battle against the worst of nature’s tempers. The story begins with Geoff telling Linda, the narrator, in a matter-of-fact tone: “I've had a yearning to sail to England ... I've reached a stage in my life where if I don't make the attempt now, it may be lost forever.” So saying, he invites her to plan for the adventure. And she does. They plan for months and finally set out aboard the Ebony, a 36-ft Roberts Spray on May 5th 1994. The plan is to travel from New Zealand through the Suez Canal to the Mediterranean, across the Med and motor up through the French canals to Calais, and finally crossing to England, but that never happened. The crew find themselves fighting their way against a devastating storm to Sydney. The writing is cinematic and the reader is left in no doubt that the narrator played an important part in this adventure. The setting is wonderful and it captures the feeling of being at sea, the elements of the weather and environmental aspects with vivid detail, like the sound of the surf sporadically pounding against the shore, the swirl of the long strands of kelp, and the stony grey surfaces against which the water laps. Linda K Ford writes with grace and uses a language that vividly depicts her kinship with the water. The reader follows the crew in their day-to-day life for many months. The narrative is intriguing, the prose exquisitely beautiful and lyrical at times, and the events well-structured to keep readers wanting to know what happens next. Love, friendship, and adventure are among the themes expertly written into the narrative. I couldn’t put this one down. Linda K Ford will make you want to pack your bags and set off for the sea.